The Seahawks trimmed the roster to 53 Saturday, leaving the Griffin brothers and the kickers as the most compelling story lines of 2018. Jon Ryan needs to return as court jester. The Seahawks reached the 53-player limit on Saturday’s mandatory cut-down day. They made a couple of small trades, acquiring a backup safety and a backup tight end, but didn’t do anything drastic in response to their 0-4 fake-football record, such as paying FS Earl Thomas a billionty-billion dollars. Nevertheless, we are certain that Pete Carroll will say sometime this week he’s “excited” about the 2018 season. Because if doesn’t say it, it would be like gravity stopped working and we’d all fly off into space. CUT: Austin Davis, Alex McGough. Maybe Hundley will be the next great ex-Green Bay backup QB to flourish in Seattle. Because once Wilson gets close to free agency, owner Paul Allen will trade him before he goes broke paying him, so Hundley needs to think about becoming the starter. Chris Carson, Rashaad Penny, C.J. Prosise, Mike Davis, J.D. McKissic. CUT: Gerald Holmes, Justin Stockton. McKissic (broken foot) is already out several weeks. By December, this cursed unit will be down to Thomas Rawls (cut by the Jets) and Radar O’Reilly. The Seahawks never were the same after FB Michael Robinson no longer was the interpreter for Marshawn Lynch. Nick Vannett, Will Dissly, Darrell Daniels. Non-football injury list: Ed Dickson. CUT: Tyrone Swoopes, Clayton Wilson, Kyle Carter. Ex-Huskies TE Daniels was acquired Saturday because Dickson is the new leader in the clubhouse for the J’Marcus Webb Free Agent Futility Award. Doug Baldwin, Tyler Lockett, Jaron Brown, David Moore, Brandon Marshall. CUT: Amara Darboh, Cyril Grayson, Damore’ea Stringfellow, Caleb Scott, Keenan Reynolds, Malik Turner, Marvin Bracy. Darboh, who probably will be brought back to the practice squad, nevertheless represents another draft bust, a 2017 third-rounder in the traditional Seahawks role of great athlete but overrated football player. Marcus Johnson was traded Saturday to the Portland Trail Blazers to team with Kevin Calabro on the broadcasts, reuniting the best tandem in Seattle broadcasting history. Justin Britt, Ethan Pocic, Germain Ifedi, D.J. Fluker, Duane Brown, George Fant, Rees Odhiambo, J.R. Sweezy, Joey Hunt. CUT: Isaiah Battle, Jordan Roos, Willie Beavers, Skyler Phillips, Marcus Henry. Injured reserve: Jamarco Jones. All you need to know about this group is that Pete Carroll fired their coaches, and expects improvements. So when they screw up this year, Carroll will fire himself. Jarran Reed, Frank Clark, Nazair Jones, Rasheem Green, Dion Jordan, Tom Johnson, Branden Jackson, Shamar Stephen, Quinton Jefferson, Poona Ford. Injured reserve: Erik Walden. CUT: Ricky Ali’ifua, Joey Ivie. Three things to know: None of them is Michael Bennett or Cliff Avril, Walden played one exhibition game and is done for the year, and undrafted free agent Ford, at 5-foot-11 and 310 pounds, has given up his day job as a kitchen appliance. Bobby Wagner, K.J. Wright, Shaquem Griffin, Barkevious Mingo, Jacob Martin, Austin Calitro. CUT: Emmanuel Beal, Jake Pugh, D.J. Alexander, Jason Hall. In light of K.J. Wright’s arthroscopic knee surgery, rookie Griffin will take his place, joining his brother, cornerback Shaq, in the starting lineup. Expect “Good Morning America” and “The Today Show” to parachute in platoons of human-interest reporters for 24/7 coverage. Shaquill Griffin, Justin Coleman, Tre Flowers, Dontae Johnson, Neiko Thorpe. 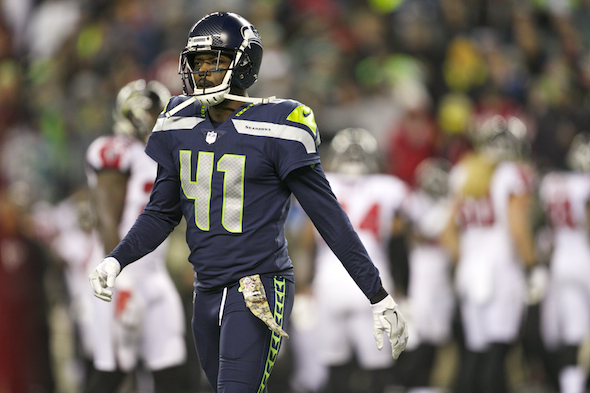 Injured reserve: Byron Maxwell. CUT: Akeem King, Trovon Reed, Jeremy Boykins, Elijah Battle. Johnson was mostly mediocre last year as a 13-game starter for a bad 49ers defense. And it looks like he’ll start opposite Shaq Griffin. See: Daniel Vogelbach, Mariners. Bradley McDougald, Delano Hill, Tedric Thompson, Shalom Luani. Reserve / did not report list: Earl Thomas. CUT: Tevon Mutcherson (injured), Lorenzo Jerome, Mike Tyson, Maurice Alexander. This is how bad the unit is: The Seahawks traded with the Raiders Saturday to acquire Luani, a former Washington State defender. That’s like hiring a heavy smoker to join the natural-gas installation crew. Sebastian Janikowski, Michael Dickson, Tyler Ott. Might be the most upgraded unit and easily the most entertaining. Which is a pathetic thing to write. I do think you’re being a bit negative, Art. If the Hawks can score 50 points a game we’ll be fine. Thanks, Art. I laughed and then laughed some more, which is a fine way to start the morning in spite of sports foibles or political malfeasance in our lowering world. The ‘natural gas installation’ line is a definite keeper! Glad to help brighten the day. Thanks for your response. I have similar thoughts. My interest is in the new (?) refrigerator Poona Ford. Go Ford! A classic here (natural gas installation) and thanks for the work—especially providing a laughworthy respite while somebody orange was playing golf while the rest of Western civilization was honoring a departed great American. A request: please collaborate with Mr. Rudman and it’s time for some sort of retrospective on the great J. Michael Kenyon. Seriously. Please. A generation of your readers could use knowledge of Mr. Kenyon. I knew him a bit in Tacoma. One day, on his radio show, he went to break, walked to his car and drove off. Yes on having read the previous story when he died but I’m thinking another article with some new stories–always a good topic in my humble and thoroughly biased opinion. Between you, Mr. Rudman, and some other sources, please . . . . Please! Mr. H73: I got through on the radio (KVI) a few times and was intimidated but he must have like me as he was disarming and we had a regular ol’ chat. I’ll never forget this plus Steve The Great Akbaba (sp?) and the G&S bumper. I listened regularly and his brain was on par with Jonathan Winters and/or Robin Williams with that rapid-fire stream o’ consciousness. There is a video on the internetS with him and Keith Shipman talking over that day’s college football scores and it’s a treasure. Are you ready for some 8-8 football? Okay. 7-9. The best tandem in Seattle broadcasting history was Keith Jackson, tied with Bob Blackburn and Dave Niehaus a close second. I believe the gents you referenced were solo acts, or were you making with the joke? Don’t be afraid to check out the winning Sounders. The jokes, of course. But Keith was rather large human. And I don’t do soccer. I’m still processing the logic in trading a sixth round draft pick for Hundley. Is he really that much better that Davis? At least Davis is familiar with the players and has had an offseason to learn the new plays. If the Hawks wanted to get rid of a draft pick that bad they should have traded it for a lineman. They think Hundley is a better passer and certainly a better runner than Davis, and he knows Schottenheimer’s style since they both worked under McCarthy. Davis is just a guy. Gee Art. You sound real positive about this year’s Seahawks. Sticking to sure things in sports? You must be a WWE fan. Let’s hope that all this snarky disrespect gets under their skins and generates a nasty attitude. Best case scenario — a stable offensive line allows a respectable running game to emerge that offsets the talent decline on the defensive side. Plus defensive coaching being Carroll’s strong suit, he might be able to squeeze extra mileage out of marginal talent and glean a few usable parts off the NFL scrap pile. I actually think the run game will work to an NFL average level. Can’t say the same for the pass D.
Attention 12’s. Curb your enthusiasm. Seriously though, I have seen predictions these guys might win as many as 7 or 8 games this year. Really? Who might they beat? Is it possible Mssrs Wilson and Carroll may be dreaming of greener pastures? Like Yankee Stadium and the South of France? Boy will you be surprised when the Seahawks beat Denver 43-8 again. Are the Broncos going with Ryan Leaf and the Boz? Mr Thiel is on a roll! Thanks for the entertaining article. Not much to get overly excited about roster-wise other than, as you stated, kickers – although I did feel a little light on my feet today…..
I’m guessing it was the holiday weekend. I’m hoping you see the tongue in my cheek . . .
I’ll enjoy not watching their 6-10 season. You’ll be there. You can’t help it.